Several recent works (for example ) predict the future of multicore systems based on Amdahl's well-known law . Amdahl's law implicitly assumes, however, that the problem size and complexity stay constant, but in most cases, more cores are used to solve larger and more complex problems. There is a related law known as Gustafson's law  which assumes that runtime, not the problem size, is constant. In recent work  we have applied Gustafson's law to symmetric, asymmetric, and dynamic multicores and have shown that this leads to fundamentally different results than the results of Hill and Marty . We have also generalized Amdahl's and Gustafson's law and studied how this quantitatively effects the dimensioning of future multicore systems. Goal of this work is to experimentally validate these scaling models in terms of problem size as well as generations of video coding applications using, for example, the PARSEC benchmark suite (http://parsec.cs.princeton.edu) and the video coding applications that have been developed in the AES group. Good programming skills, ability to work independently. Parallel programming skills or the willingness to acquire them, knowledge of parallel computer architectures and programming models. Mark D. Hill and Michael R. Marty. 2008. 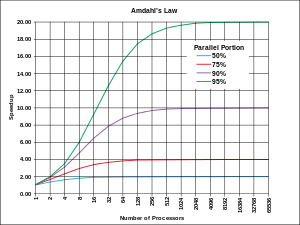 Amdahl's Law in the Multicore Era. Computer 41, 7 (July 2008), 33-38. Gene M. Amdahl. 1967. Validity of the single processor approach to achieving large scale computing capabilities. In Proceedings of the April 18-20, 1967, spring joint computer conference(AFIPS '67 (Spring)). ACM, New York, NY, USA, 483-485. John L. Gustafson. 1988. Reevaluating Amdahl's law. Commun. ACM 31, 5 (May 1988). B.H.H. Juurlink and C. H. Meenderinck. 2012. Amdahl's law for predicting the future of multicores considered harmful. SIGARCH Comput. Archit. News 40, 2 (May 2012), 1-9.